Most of us are gearing up for the 100th anniversary of the sinking of the Titanic in April. Press over the Titanic event has been so noticeable, today’s special birthday anniversary nearly slinked by, unnoticed. It’s a good thing Nabisco’s Oreos have rocked out as a steady standard since they were first introduced in round tins with gold wrappers in 1912. To celebrate its 100 year anniversary, last week Nabisco released its latest limited edition product, the fittingly titled “Birthday Cake Oreos,” replete with icing flavored filling and my personal favorite, sprinkles! The cookie will remain on shelves for the next couple of months. In addition, the company is so excited about today’s celebration it has even released a special birthday page on the Kraft Foods (parent company to Nabisco) site. All the hullaballoo over a birthday may seem a bit over-the-top, but Oreos are one special kind of cookie. If you think about the brands' historical timeline, Oreos made it through the Depression, boomed during prohibition, made it through multiple wars, changed from metal tins to plastic containers, spawned a vegan/not vegan debate, changed shapes, sizes, and flavors numerous times, changed slogans, and still remain one of the world’s favorite cookies. Not too shabby. So, Happy 100th Birthday, Oreos! 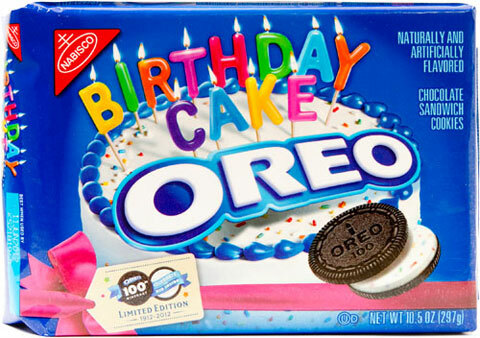 To celebrate, I plan to indulge in a whole package of “Birthday Cake Oreos,” all by myself.